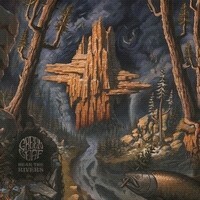 Swedish Stoner rockers GREENLEAF are offering a brand new release consisting of ten new songs and about 48 minutes of new stuff. Founding member Tommi Holappa passed through a few line-up changes but it kind of gained stability since 2012's nest of vipers, that consolidates it all and let the band create on solid ground. GREENLEAF's "Hear the rivers" is the result of Tommi Holappa's concentration on getting more stability and a full touring machine.And it is good. I must admit i'm a GREENLEAF enthusiast. I know them for a few years and there's been some evolution and changes in their sound and compositions. First the vocals…they are more detached from the music. The use of effects makes the voice more vintage-like and it’s quite cool. The album was engineered by Karl Daniel Lidén, who worked with KATATONIA,SWITCHBLADE and yeah, DOZER.GREEN LEAF shares two members from DOZER. "Sweet is the Sound" was quite a cool twist, dealing with black spiritual music to forge an ambiance that reminds me of ZEAL AND ARDOR.We got something challenging here, something new. "Good ol' goat" kicks us in the balls with his excellent rhythm n' blues. "High fever" proposes a blend of nice rhythmics that we can almost call garage rock or rockabilly! "Point of secrets" is reminiscent of some TRUCKFIGHTERS for me , maybe some CLUTCH too.Ex singer quit GREENLEAF to form now defunct TRUCKFIGHTERS like ten years ago. "We are the Pawn" and "The Rumble and the Weight" are the ones fans will accept as their own since it sound like "Home Sweet Home". "In the caverns bones" sets another mood as we are exposed to some strange narrative and singing meld in a reverb-like cavernous feel that makes this song the most spacey and vastly sounding of the records. GREENLEAF has gained some more stability in like five years.This record shows it.While working with an ex member engineer, they are nailing down their nails through the ground as never before. This is a well produced, well written album and maybe the most effective one to date they did create. As a fan i can find greatness in all of their releases, but this one gives them a great status in the ocean of stoner rock bands nowadays. They are ready to deliver.